On August 27, 1891 a west bound train had just passed through Statesville, NC. Passenger train No. 9 was chugging along normally in the early morning hours, when it came to Bostian’s Bridge that spanned Third Creek about two miles west of Statesville. At the bridge the train derailed and plunged 60-75 feet into the ravine below. More than 20 people were killed and close to 30 were wounded. Some people say that if conditions are right, each August 27th you can actually hear the crash. 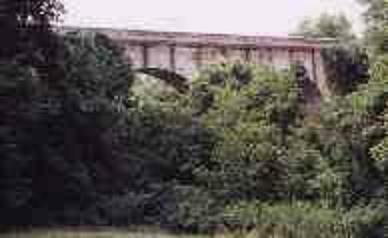 It’s known as the “ghost train” of Bostian’s Bridge. Each year there are a number of people who gather, on the anniversary of the crash, to listen for the sounds of a train wreck. This year was no exception. There were about a dozen people on the bridge in the middle of the night, waiting to hear some sound of a train. Those people did indeed hear a train, but it was not a “ghost train.” They realized suddenly that there was a real train coming around the bend. All of the people scattered to clear the tracks on the other side of the trestle. All of them made it across but one 29 year-old man. 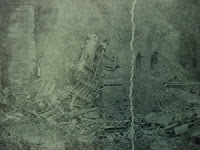 The man was struck by the train, and then thrown into the ravine by the force of that blow. He did not survive. David was toying around with sin. The things he did at first were not huge errors, but they were errors nonetheless. He didn’t go off to war like the other kings, he was too comfortable in his palace. He looked over into Bathsheba’s house and saw her bathing, he didn’t look away. These are not the worst thing David could have done, but they were wrong. The problem is that even what we consider to be minor sin in our lives often leads to major ones. From David’s “small” sins, he wound up committing adultery and causing Bathsheba to do the same. He made his guards have to cover for him. He forced Joab to do something very unethical. He got Bathsheba pregnant. He arranged for Bathsheba’s husband, Uriah, to be killed in battle. From simply not following through in his duty, to murder was a very quick, slippery slope. Just like the young man who was waiting for a “ghost train,” David thought he was safely playing around with something fun and exciting. However, just as the man on the trestle, David was hit by the train of sin, which threw him down and almost destroyed him. Many times we are fooled into thinking we can “get away” with our sinfulness. We think we can beat it if we begin to become ensnared in it. The reality is that we may never know that we are trapped until it is too late. What’s the cure? We need to stay away from those things, people, places, and atmospheres that can lead us down the path to sin. There are many things that we surround ourselves with that make it easy to fall prey to sin. Eliminate them from your life. Also, we need to apply God’s Word to our lives. We need to know what God is saying to us through His Word, and obey. Then, we need to pray for the strength and wisdom of the Holy Spirit to help us know what is good and righteous. If we are in a right relationship with God, He will open our ears, eyes, mind, heart, and spirit to see the world as He sees it. When that happens, we will stop chasing after sin like the young man sought the “ghost train,” and avoid the consequences of living carelessly. My sincere condolences go out to the family of this young man. May God grant you peaces in this time of loss. S.W. Is There Anyone Who Fails?